Russian President Vladimir Putin has accused European countries for whipping up fears over the reliability of Russian energy supplies. 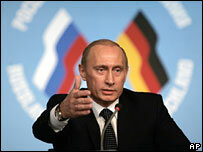 Speaking after meeting German leader Angela Merkel, Mr Putin said Russia and Europe must agree "rules of the game". Russian firms could seek new markets in Asia if they were not free to operate in Europe, he said in a veiled threat. European anxieties on the issue have been growing since Russia briefly cut gas supplies to Ukraine in January. The stoppage had a knock-on effect, hitting supplies to other European countries further down its pipeline. Fears about Russia's supplies resurfaced in the UK recently after it emerged that Russian gas giant Gazprom was eyeing British Gas owner Centrica as a potential takeover target. The BBC's Andrew Walker says Russia is unlikely to break any existing contracts, but firms know perfectly well there is enormous demand for their oil and gas in Asia. The timing of Mr Putin's comments, after a meeting with the German chancellor, was unlikely to be a coincidence - the message would not go unheeded, our correspondent adds. The Kremlin leader denied Moscow had any plans to restrict energy supplies to Europe - the continent was, he said, a natural and convenient partner for Russia to do business with. In a fierce defence of his country's reliability as a supplier of energy, Mr Putin said even during the Cold War, Moscow had always fulfilled its commercial energy contracts with European states. But opposition to Russian expansion in European markets could force Moscow's companies to look elsewhere, he added. "We are being blocked to the north, the south and the west on any pretext. We have to find outlets, to fit into the global development process. "What are we supposed to do in these circumstances, when every day we hear the same thing? We start to look for other markets." Mr Putin singled out apparent support in the UK for special legislation designed to prevent Russian firm Gazprom buying a controlling stake in UK gas distributor Centrica. "What kind of reaction is this? What about globalisation? What about free markets? What is this?" Russian oil and gas companies have benefited from high fuel prices in recent years and have become keen to expand their businesses. However, Mr Putin said, when European companies invest abroad they call it "investment and globalisation", but when Russians go abroad, it is seen as expansion. Russia: Bully or just applying the rules?